14 September 2016, Singapore - Renault driver Jolyon Palmer’s comment about the unconventional challenge in store sets the scene perfectly for the ninth running of the FORMULA 1 SINGAPORE AIRLINES SINGAPORE GRAND PRIX this coming weekend. The state of play in the Drivers' World Championship could hardly be more exciting. All right, it's a two-horse race – but both horses are of high pedigree and only two points separate them as they come to Marina Bay Street Circuit. Both wear the colours of Mercedes: Lewis Hamilton leads the way on 250 points from Nico Rosberg's 248, but it's the German who has wrested the momentum back as they approach the finishing straight. The ninth Singapore Grand Prix will be the 200th in the 31-year-old German's Formula One® career. 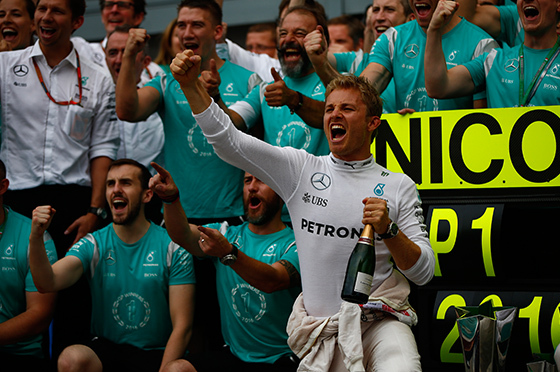 Once 43 points ahead, then suddenly 19 points down, Rosberg has won the last two races at spectacular Spa and mighty Monza to re-ignite the challenge for his first drivers' title. Nico now has seven wins in 2016 to Lewis's six; Lewis has seven poles to Nico's six; Rosberg has five fastest laps, Hamilton three. It could hardly be any tighter than that. Hamilton, however, can point to an outstanding record in the Lion City. The Englishman has been on pole here three times and won twice; Rosberg has so far done neither in Singapore. Hamilton is also gunning for a landmark 50th career victory, with this season – seven races left – likely to see him edge ahead of Alain Prost's 51 to become the second most winning driver in Formula One® history after the great Michael Schumacher. But as Jo Palmer's opening remark reminds us, Singapore is unconventional in so many ways: a night race, with light levels varying through the weekend from day to artificial light in race conditions... high levels of heat and humidity to sap drivers' energy in the cockpit... grip levels that change dramatically as the weekend wears on... and, not least of all, 23 corners to be negotiated no fewer than 61 times. While the Mercedes men have the biggest prize in sight, behind them there's still plenty to play for. Who will end up Best of the Rest, for starters? Right now it's Australia's Dan Ricciardo who lies third, but his 161 points put the Red Bull Renault man only 18 ahead of Ferrari's Sebastian Vettel. Singapore could help them both. Seb has local history on his side: he is one of the three drivers to have won in Singapore, and he has done so no fewer than four times, including last year. Danny Ric, meanwhile, is on a Singapore roll: he qualified third and finished third two years ago, qualified second and finished second last year... you see where that one's going. 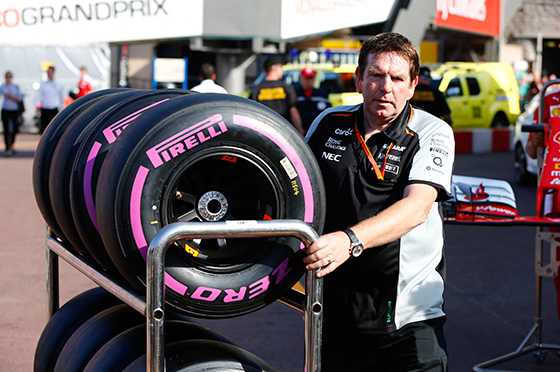 We also need to factor in a new variable for 2016: tyres. Yes, they have always had them – but they have never had so many to choose from. This year Pirelli has five 'slick' compounds and will bring three of them to Marina Bay: Soft (Yellow), Supersoft (Red) and Ultrasoft (Purple). We know in advance, too, that Hamilton and Rosberg are playing it slightly different here: of the 13 sets to be nominated by each driver, Lewis has opted for 3 Soft, 3 Supersoft and 7 Ultrasoft, while Nico prefers a 4/2/7 split. Several drivers have gone down a different path with a 1/3/9 combination. In the constructors' stakes Mercedes are out of sight with a massive 498 points, but Red Bull on 290 lead Ferrari by 11. Ricciardo and Vettel will want maximum back-up from teammates Max Verstappen and Kimi Raïkkönen respectively. Further back, Williams – deeply disappointed not to be challenging higher up – are fighting desperately to retain fourth place ahead of Force India. Just three points separate the two teams as they arrive in Singapore. Last but not least, several Formula One® players will be trying to secure their own place in the Singapore spotlight as Formula 1 goes through a changing of the guard, both on track and off it. The prize seat up for grabs in 2017 is surely at Williams, where the much-loved Felipe Massa will bid farewell to Formula One	® at the end of the season. So, as the sport's first night race prepares for its ninth edition – already! – there is still a great deal to play for in this, the longest season in Formula One® history. What surprises does Singapore have in store this time?